The exhibition Surface Work (11 April – 16 June 2018 at the Victoria Miro, Mayfair) was a rich feast, with abstract work by more than 50 artists, all women, from five continents, spanning every decade between 1918 and 2018. I knew of some of the artists who have “shaped and transformed, and continue to influence and expand, the language and definition of abstract painting”: Helen Frankenthaler, Yayoi Kusama, Lee Krasner, Agnes Martin, Mira Schendel, Gillian Ayres to name a few, but the majority were new to me, and it was revelatory to ‘discover’ so many artists who had been there for years, producing fantastic work in obscurity. The exhibition gave me the opportunity to see work I had only seen small reproductions of in books such as one of Yayoi Kusama’s Infinity Nets. 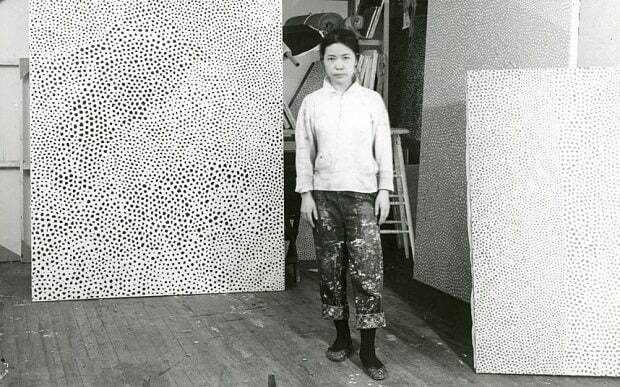 Kusama began painting the Nets in the early sixties shortly after she moved to New York, living in poverty until she began to sell work through a dealer. I love the intensity and repetition of the repeating loops that seem to expand and contract like a murmuration. There is a tension between a random and systematic aesthetic. Apparently, Kusama would paint the Nets for uninterrupted sessions of 40 to 50 hours as a way to channel and contain her mania. She has repeatedly revisited and expanded this body of work throughout her career. Also immersed in the tradition of the sublime is Loie Hollowell’s work. Link Lingam (yellow, green, blue, purple, pink) 2018, has an intriguing undulating surface that folds into the design giving it a sculptural element. Jessica Warboys’ large canvases are ‘painted’ by the sea shifting and scattering mineral pigments into them. The coast and landscape are a source of inspiration and influence for Warboys, who draws upon pagan history and folklore in her films and performances. She had a solo exhibition at Tate St Ives recently that included Hill of Dreams, a film that draws from Welsh fantasy writer Arthur Machen’s book of the same name. See here for the online catalogue with overview of every artist.